I love spring!!! Being a May baby has changed my life. (Literally) I share the same birthday with a lot of my old classmates from my hometown (in Waltham). I love flowers, warm weather and fresh spring air. My middle name is.. (drumroll pleaseeee) is Orchid!!! Yup. Cindy Orchid Chen, it wasn't written on my birth certificate but that's what a lot of my relatives called me in Chinese. My mother's favorite flowers are orchids, but my favorite flowers are peonies. In this blog post I will be talking about all of my favorite fashion finds- and things for spring!! It has been a brutal winter in New England which included snow on spring break, nor'easters every week, one single beautiful day running along the Esplanade. I live in New England, go figure. LOVE this bag!! Fun fact, I've never owned a designer crossbody until now! I love the pink because duh pink is my favorite color! Next to periwinkle. Light pink is considered a neutral for me- this little crossbody has already been my new obsession! I collected a bunch of the Gucci Marmont camera bags in the collection above! My pink bag is sold out on the Gucci website, but don't fret- they will always restock in a couple of months! This is one of my favorite Etsy purchases ever! 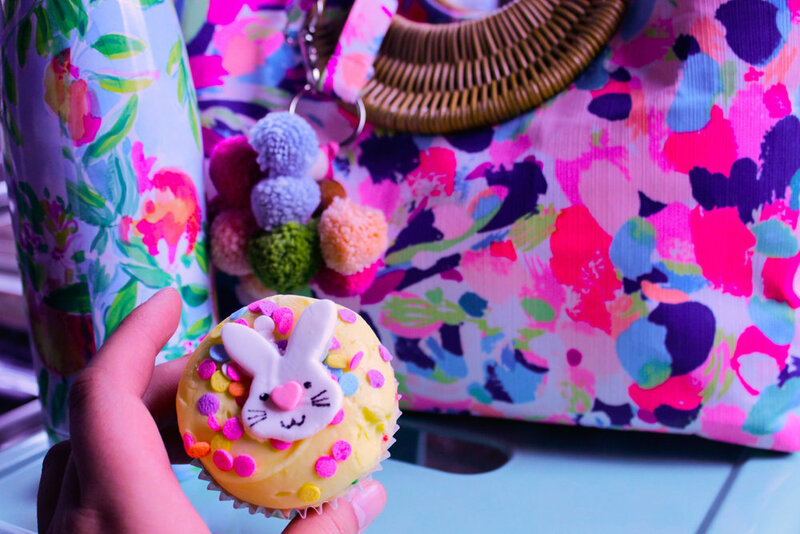 Pina Colada Club is one of my favorite prints, I bought the luxletic leggings last year at Lilly and they changed my life- they have one pocket on the right side and I can put my phone or Louis Key Wallet in there!Â Such an adorable one of a kind handmade piece. The color combination with the poms and fabric was a good choice. I love the wicker handles- it's small but I can still fit a water bottle and my ipad! AMAZING. I literally bring this bag to my lectures!! 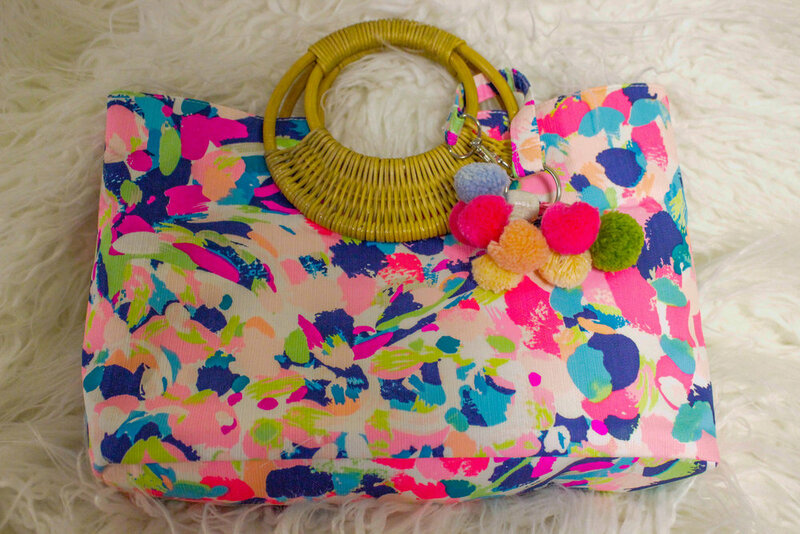 You can find this bag in the print "Off Tropic" with matching pom pom keychain here (PST it's 25% off until April 10th!) Etsy purchase from Marina's Closet, she has other cute totes and wristlets for sale! + Hair bows and scrunchies. DISCLAIMER- Although I think these little coin purse and crossbody are adorable, I have not purchased!! (YET) But perfect for the spring and summer I bring to you- Kate Spade Chesapeake bay! Crabs and Lobsters. I am for sure purchasing both!!! I love lobsters and crabs!!! - I also listed some other crab and lobster goodies down below! 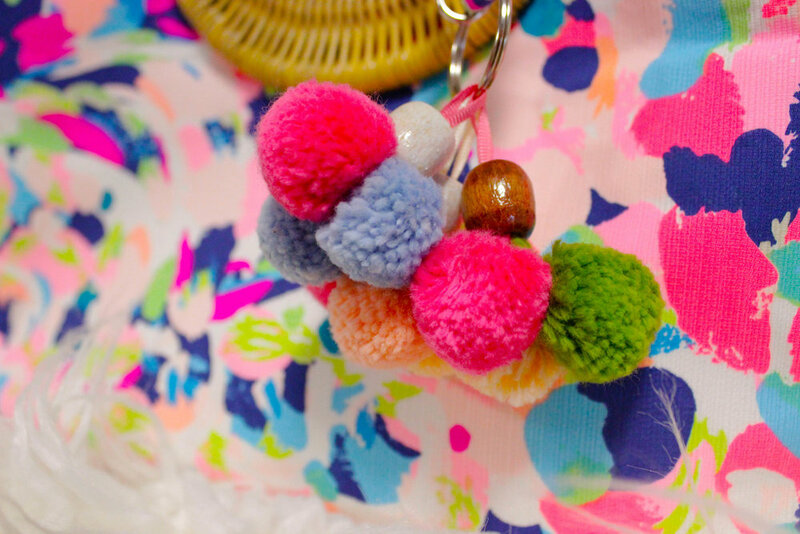 I love the pom pom keychain, and the sticker pocket. So fun for summer! You should really see the red leather in person, it's so crisp and it's a true red. Statement sleeve tops that are similar to mine are posted down below! Could not find the exact links to each top- but there are some great deals on them right now! I love these tops because they add a nice flair to any plain top! Secrets out, I got this top at TARGET! It is not available anymore- but I did link more lace tops down below from Target. "OPI The I's have it"
I'm a little upset that I didn't purchase this top earlier! It's so flattering on, I purchased an XL for it to be more flowy on me. You can buy it here and it's on sale for $230! 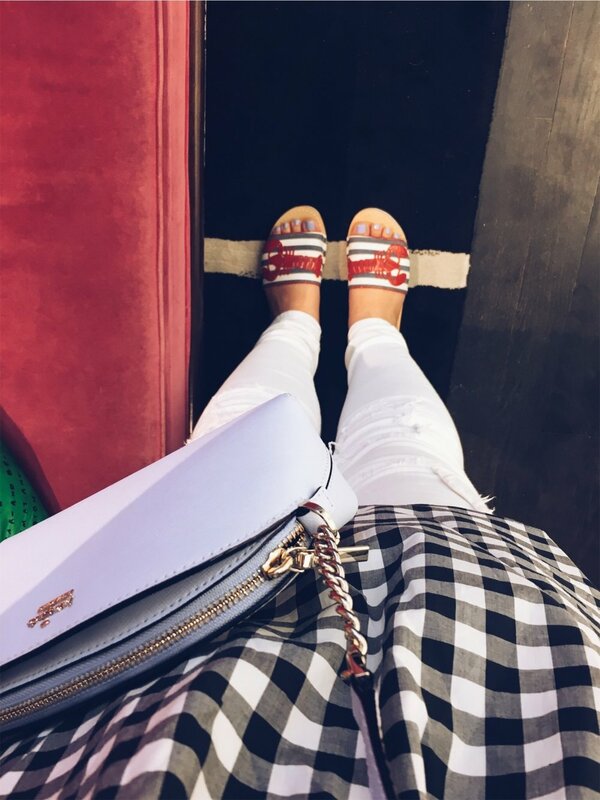 I listed similar shoes down below, the Kate Spade sliders that I have on in this photo I found them on sale at TJ MAXX. Shop this look down below! I'm in love with this gingham top from Kate! My lobster slides are too cute with my pedi! Make sure to shop my look down below!